Written near the end of World War II, amidst increasing fear of the Soviet Union, George Orwell puts in simple terms his views of Joseph Stalin in his allegorical novel, Animal Farm. Although this classic is a fable, the setting parallels twentieth-century Russia. The animals of a simple barn house are growing dissatisfied with their owner, Mr. Jones. One boar, Old Major, calls a group meeting of his fellow animals. With powerful words, Old Major tells of how these humans, or “parasites,” have steered the farmland wrong and emphasizes a need for change. With this new voice, the animals grow restless with Mr. Jones. When Old Major dies, two pigs, Napoleon and Snowball, take over leadership. ­Finally, a revolution occurs, ending with Mr. Jones being driven from his own farm. The pigs are now ruling the other animals, and they create seven commandments for the farm. However, the leadership soon becomes corrupt. Unfortunately, through lies and betrayals, the horses, sheep, cows, birds, and other animals are blind to the change. Afterwards, the story comes full circle with an ending that will shock the reader. This well-written tale is organized and never rambling, but what really makes the story stand out is the revelation of the truth behind it: Orwell's summary of the rise and the major drawbacks of the Soviet Union. The revolution of the farm represents the Russian Revolution, with Old Major as the original communist leader Vladimir Lenin, Snowball as Leo Trotsky, and Napoleon as Joseph Stalin. The rest of the animals symbolize other classes of Soviet Russia, from the horses as the millions of hardworking, misled citizens, to the dogs, Stalin's vicious secret police, the KGB. This story will give readers a new look at world history. 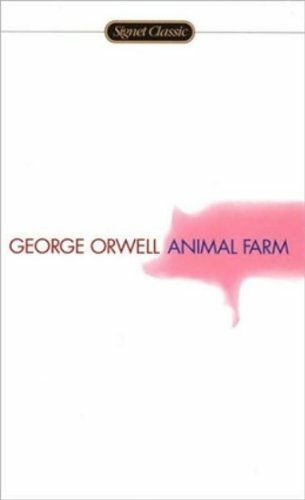 Orwell brings the reader into the setting, vividly describing the situation, allowing us to realize the faults of the farm though the animals do not. The ending is grim but helps the reader understand the predicament of 1945. This book will appeal to any reader, whether you want a historical novel or a fantasy story. After reading Animal Farm, one cannot help compare what is written and what is real.